Cycling sees your eyes at risk from dust, dirt, gravel and stones. Grains of dust and flecks of dirt bring might only cause mild irritation before your body naturally flushes them away, but they also bring the potential for infection if you're unlucky. Larger projectiles and impacts during crashes can also cause more serious, permenant damage. Wearing glasses helps prevent such injuries. Whatever the weather, your eyes are also subject to harmful UV radition; it's more of a danger in bright sunshine, but it's still damaging through cloud cover. Just like your skin, your eyes can be burnt by the sun if exposed to excessive UV radiation in a short space of time, a painful condition known as photokeratitis. Long-term exposure damages the retina and increases the chance of developing cataracts. It is still not known exactly how much exposure is required for damage to be done, so it is recommended to take protective measures such as wearing UV blocking glasses whenever possible. 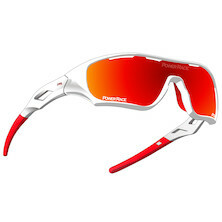 Note that wearing tinted glasses without a UV rating actually increases UV damage. Dark lenses cause your pupils to dilate in order to let more light in, just as they naturally do at night. Without UV-filtered lenses, this means that even more UV radiation is let in too. Keeping flying debris out of your eyes has other safety benefits too. If you're squinting your eyes to keep dust out, you can't see what's going on around you properly. There might be a car pulling out ahead; you might mis-read the terrain on a tight corner; a fellow rider might be veering into your path. By putting a shield between you and the environment, you can keep your eyes open and trained on potential hazards. The same applies in heavy rain; no one can see properly with water streaming into their eyes. Wearing glasses helps keep it out. If you're wearing glasses all the time, however, your vision will only be impaired again if you're using the wrong lenses. Clear lenses in bright light will mean squinting to keep the sun out of your eyes. Dark tinted lenses at in low light will make everything too dark. That's why most cycling glasses these days come with interchangeable lenses so you can customise your glasses to your riding conditions. 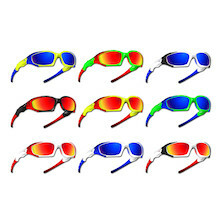 Generally, glasses will come with one tinted set of lenses for bright sunlight and a clear set of lenses for low light. Yellow lenses are also available, which actually improve visability in flat light or dark conditions by making things appear brighter. High-end manufacturers like Oakleys also offer different levels of dark tint for extra customisability when the sun is shining. There are performance benefits to unimpaired vision too: having a clear view means that you can see every bump in the terrain to spot the best lines and you can keep a firm eye on the competition to respond to any attacks as soon as they're launched. Anti-fog: Perspiration can cause condensation to form on your lenses and obscure your vision. Anti-fog lenses help stop that. Hydrophobic: A special coating that repels water faster, keeping your vision clear in wet conditions. 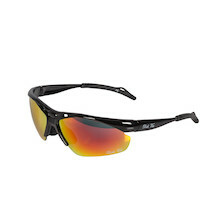 Click here to see our full range of eyewear!